F4U-1 Corsair performs a high speed turn photo by Warwick Annear on Flickr (noncommercial use permitted with attribution / no derivative works). 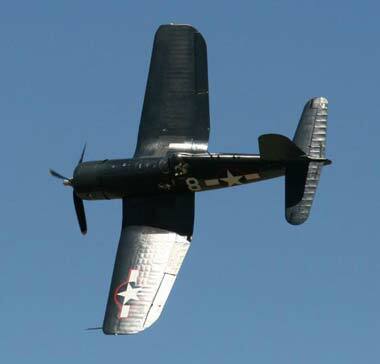 Connecticut designated the Corsair F4U as the official state aircraft in 2005 (Connecticut also recognizes a state ship and tall ship ambassador). 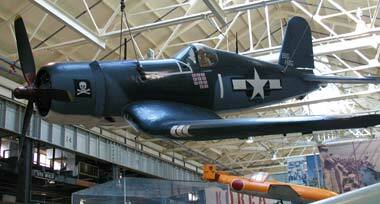 The F4U Corsair was one of the best fighter-bomber aircraft during World War II and the Korean War. The Corsair F4U was distinct because of the inverted gull-wing design (which allowed ground clearance for the huge 3-blade propeller). Over 12,000 Corsairs were built between 1938 and 1945 by Connecticut workers at Hamilton Standard, United Aircraft, Pratt and Whitney, and Vought-Sikorsky. F4U Corsair in Navy Museum, Washington DC; photo by Mr. T in DC on Flickr (noncommercial use permitted with attribution / no derivative works).